Though you wouldn't want to rely on them for mixing, the 3000 Series are ideal for monitoring. Great for monitoring. Comfortable to wear in the studio and on the street. Lack of presence means they're not suited to mixing. 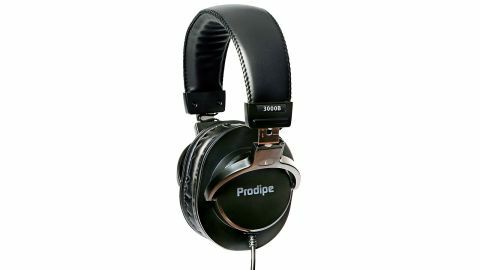 French manufacturer Prodipe has released a new range of headphones, the 3000 series. "We found them perfect for general monitoring duties"
Claimed to be do-it-all cans that you can feel comfortable wearing in the studio and on the street, the 3000 series come in a variety of colours, including all black, super-pimping white and a black/red affair, which look like the least desirable. They are 32 ohm, with a none too shabby frequency response of 15Hz-22kHz, and 40mm drivers. The styling is pretty standard and, whilst you wouldn't mind wearing them out and about, they don't feature a removable cable and won't fold down into a bag-friendly shape either. We wouldn't trust them for mixing duties due to a lack in presence and they seem a bit heavy in the mid-range, but we found them perfect for general monitoring duties.